The Whitney Plantation is over 260 years old and was originally named Habitation Haydel, after the German immigrant Haydel family that owned it. 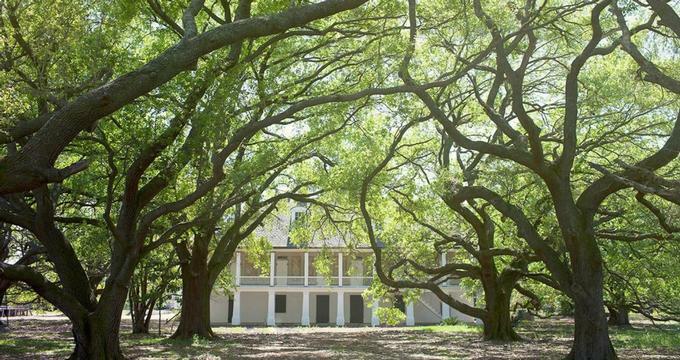 The restored historical plantation has been on the National Register of Historic Places since 1992, and recently opened to the public as a museum with a focus on slavery. Exhibits offer a combination of restored historical buildings and landscapes, artistic sculptures, and hundreds of oral histories, which give insight into the experience of the slaves on the Wallace, Louisiana, plantation, which is located on the historic River Road. There are over 12 original and replica structures on the plantation. These include the Big House, a French Creole-style home built in the late 1700s. The brick and cypress structure is among the most well preserved in Louisiana and was referred to in 1946 as “the most interesting in the entire South” by renowned landscape architect Charles E. Peterson. The Big House includes rare decorative paintings and frescoes on both the interior and exterior walls, which were commissioned of the artist Dominici Canova. The detached kitchen was built around the same time as the Big House and is the only structure of its kind still standing in Louisiana. Pigeonholes in each end of the gabled roof allowed for the kitchen building to be used as a pigeonnier. Two additional pigeonniers, or roosting houses for pigeons, are located nearby. These pigeonniers were built sometime prior to 1820. A French Creole barn, the last surviving in the United States, was also built in the early 1800s. Of the original 22 slave cabins on the plantation, two are still standing today, while an additional five were brought to the museum from Terrebonne Parish’s Myrtle Grove Plantation. Also donated to the museum was the Antioch Baptist Church, which came from the Antioch congregation in Paulina, Louisiana. Three different memorials to enslaved persons are located on site. These include the Wall of Honor, on which the names of all the known Whitney Plantation slaves plus their country of origin are engraved on granite slabs. The Field of Angels is dedicated to the 2,200 children who died as slaves in St. John the Baptist Parish. The memorial includes a bronze sculpture of an angel delivering a child to heaven, made by the artist Rod Moorhead. The Allees Gwendolyn Midlo Hall memorializes all Louisiana slaves. More than 100,000 names are engraved on granite, along with slavery-related quotes and pictures. The memorial is named for Gwendolyn Midlo Hall, a scholar who wrote two books in the 2000s about the history of slavery in the United States. Throughout the property, over 40 sculptures of slave children by the artist Woodrow Nash are posed in lifelike stances. The sculptures serve to remind visitors that slavery did not only impact adults, but families and children as well. In addition to the structures and memorials, the museum includes a collection of artifacts. Agricultural equipment and tools, furnishings, and a set of sugar kettles are among the historical memorabilia. The German immigrant Ambroise Heidel (1702–1770) was the original owner of the plantation. From modest beginnings, Heidel began farming indigo and soon grew a successful business. In 1803, his youngest son, Jean Jacques Haydel Sr. (1744–1826), took control of the plantation and converted the business from indigo to sugar. The plantation continued to grow in size and success with the contributions by hundreds of enslaved people. At the end of the Civil War, Bradish Johnson purchased the plantation and re-named it after his grandson, Harry Whitney. The site remained a working sugar plantation and farm with several owners through the 1980s. In 1990, it was purchased by the Formosa Chemicals and Fiber Corporation, which planned to convert it to a rayon factory. Local activists and environmentalists prevented this from happening, and the Formosa Corporation decided to save the site’s historic buildings and convert it to a museum. In 1999, after the museum was established, the decline of the rayon industry prompted the sale of the property to the John Cummings of New Orleans, who operates the plantation and museum today. The Whitney Plantation can be visited by guided tour only. Several tour operators provide transportation to and from New Orleans, which includes a tour of the Whitney Plantation grounds. For those with their own transportation, guided tours are available upon arrival to the site. Groups of 20 or more must schedule in advance.